Skateboarding is immensely popular here in America, and there is tons of gear that goes with it. But now there is a new company called Fallen Footwear, and they feature many items with darkly-themed stylings. One skater shoe of particular interest is the Fallen Skate Shoe called “Deathwish”. The Devil and the powers of darkness are making a push for control in this country never seen before in our 238 year history. 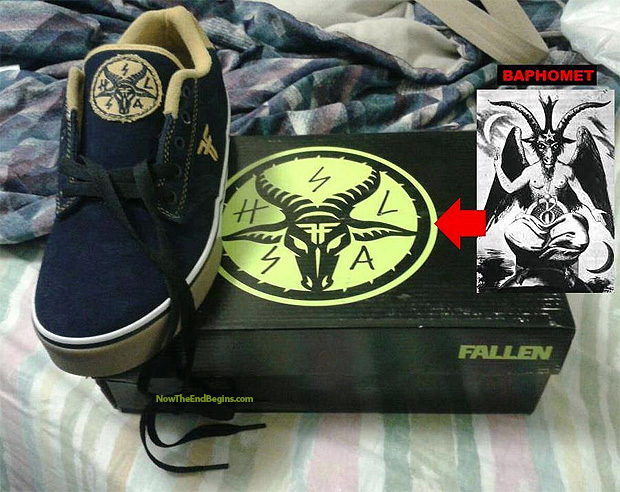 The “Deathwish” skater shoe, marketed to young teens, is quite notable because it features the Satanic Baphomet Goat’s Head at the top of the shoe, as well as in the inside bottom. There is a huge push in America to bring the things of the Devil into the forefront and make the “respectable”. Music stars Beyonce, Jay-Z, and many others all feature Satanic lyrics and imagery in their music videos purchased and listened to by millions of young people. Satanism is becoming popular with youth culture, with the MLB, the NFL, and just about everywhere you look. For many years now, Monday Night Football and others have played AC/DC’s occult hit “Highway To Hell” as theme music for a lot of their games. Can you imagine a song that celebrates dying and going to Hell to burn for eternity being played to promote what passes as “family entertainment” in 2014? If you love your children you will protect them. Choose sides and fight.